The last two songs have been kinda sad, so I thought I'd pick things up a little...at least tempo-wise. This song by Chumbawamba is particularly interesting from a musical standpoint because it's one of those songs that's upbeat and peppy and really gets you boppin' along, but it's really about a subject that's much darker than the mood it creates...although once you learn the story, whether or not this lighter mood is appropriate or not becomes a matter of perspective. This is a true story about a man named Wenseslao Moguel, who's name is famous for being on the many lists as being one of the Top 10 Most Amazing Execution Survival Stories. In the early 1900's, Mexico was under the autocratic rule of Porfirio Diaz, who had held the Mexican presidency continuously since 1876. However, despite his re-elections, Diaz's regime was becoming more and more unpopular because of his political policy continuity and his repressive acts against the Mexican people. As a result, early in the 20th century, Francisco Madero Gonzalez, a wealthy politician, became the centerpiece of a movement to oppose any further re-election of Porfirio Diaz, having previously attempted to win elections with either himself as a candidate or a candidate of his choosing. None of these attempts to win the government were successful, yet he continued his opposition of Diaz. By 1910, Madero's political activities had gathered enough momentum and enough followers to disrupt the current status quo, and what followed after would go down in the history books as the Mexican Revolution, also known as the Mexican War of Independence. From the Mexican state of Durango came one of the most famous leaders of the Mexican Revolution, José Doroteo Arango Arámbula, aka Francisco "Pancho" Villa. Villa and his Villistas joined the Modero movement against Diaz, and in 1911 led the attack on Ciudad Juarez, which overthrew Diaz and put Madero into the presidency. Villa was appointed to the position of military chief commander; however, he and his commanding officer were now at odds with each other, and during an incident involving a horse, Villa was charged with insubordination - a charge for which execution was the penalty to be paid. Villa escaped to the United States and did not return until after the assassination of President Madero, and the presidency fell to Victoriano Huerta . Pancho Villa returned to Mexico to confront the Huerta dictatorship. 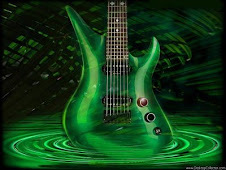 It is here that our song person enters our story. Wenseslao Moguel was a soldier under the command of Pancho Villa who was captured on March 18, 1915 by the Federales, which is the term given to Mexican Government troops, particularly those in Huerta's Federal Army from 1910-1920. Wenseslao was branded a traitor and sentenced as such - to die via fusillade (firing squad). During the Mexican Revolution, firing squad was the preferred means of execution. The squad was comprised of 9 soldiers who would all fire their weapons at the same time. The 10th shooter, an officer, was to aim at one of the prisoner's vital organs and deliver the "coup de grace" - the kill shot that would ensure the death of the prisoner. Wenseslao was just such a prisoner. The Federales soldiers took up their positions to execute Wenseslao, and each one fired, including the officer delivering the "coup de grace", which was to be aimed at Wenseslao's head. Since the rifles were at point-blank range from the victim, after firing at Wenseslao the soldiers did not check to see whether or not he was still alive or not. They assumed he was dead, but they couldn't have been more wrong. Wenseslao was, in fact, shot in the face, chest, and in the head, but they did not kill him. He lay waiting for everyone to leave and then presumably crawled to safety. 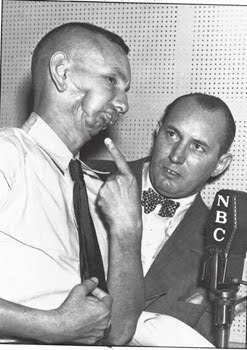 Though horribly disfigured, Wenseslao Moguel became legendary for his survival after sharing his story on the radio with Robert L. Ripley, founder of Ripley's Believe It Or Not. The show aired on NBC and CBS during the 1930's. After his radio interviews, Wenseslao Moguel also made appearances at Ripley's Odditorium in Cleveland, Ohio, and traveled the country with the Ripley's Museum. He became famously known as "El Fusilado" - the executed one. What would you say if you knew what I was thinking? What if i knew what you needed for sure? What can you settle for? Even though this is more of a love song bearing only a couple references to an actual historic event, mushy ballad or not, it did exactly what the title of this blog says - it remembers, or rather, causes someone else to remember or to become intrigued about its lyrics and learn something academic. I first this song when I was a kid, and this was the first time I'd heard anything about the Cuyahoga River catching on fire, and since this river was right in my back yard, I trotted myself up to the library to find out more. It would be one thing if we could say that the Cuyahoga River fire was a freak accident, we learned from it, and it never happened again. However, it didn't happen just once - it happened in 1868, 1883, 1887, 1912, 1922, 1936, 1941, 1948, 1952, and 1969. And when they say that the river caught on fire all those times, it doesn't mean that many vessels had to be put out or that there were many fires along its banks. When they say that the river caught fire, they mean the actual river, itself, went up in blazes causing $1.5 million in 1952 alone. 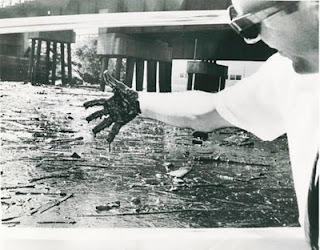 The last fire on June 22, 1969 lasted 30 minutes, and even though it only caused $50,000 in damages (mainly from damage to overpassing railroad bridges), it was enough to create national awareness to the environmental problems in Ohio, and "sparked" a national movement to improve water pollution control activities, including the creation of both the Federal and Ohio Environmental Protection Agencies. 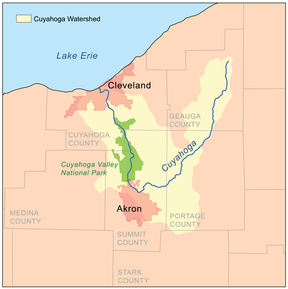 The 100 mile Cuyahoga is also one of the main watersheds in NE Ohio, collecting waste and runoff water of an area of 813 square miles, and from as far south as Akron.The City of Cleveland was founded at the mouth of the Cuyahoga River when General Moses Cleveland of the Connecticut Land Company surveyed the company's holdings. The city became the capital of the Connecticut Western Reserve, being the obvious choice once the founders saw how much the area was fit for commerce. Cleveland, of course, is located on the shores of Lake Erie, which is also connected to the other four Great Lakes and the Atlantic Ocean via the St. Lawrence Seaway. 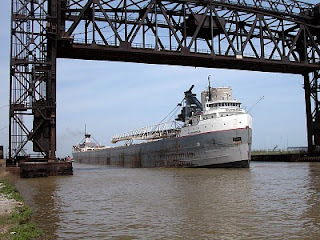 At the time of the city's birth, the Cuyahoga was a popular waterway for American Indians and fur traders and was well-known for it's many trading posts along its course, which were the first forms of commerce and industry along the river. However, this is considered to also be a key factor in its demise. 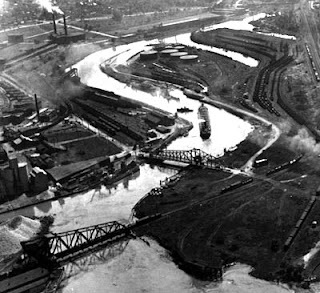 The Cuyahoga meanders too much and is too unpredictable for long-distance travel, however moving goods a short distance was still possible, and as the City of Cleveland continued to grow, more and more businesses and factories began springing up on its banks to take advantage of the river's water in one way or another. As the City of Cleveland continued to grow, it attract more commerce along the river and along the shores of Lake Erie, into which the river empties. 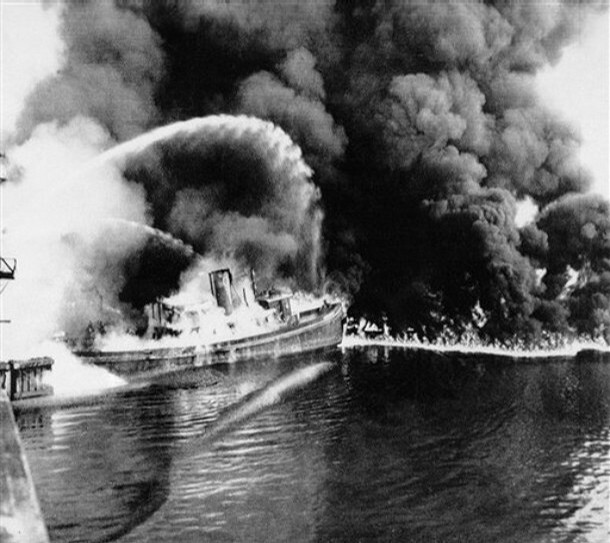 While Lake Erie is the source of the city's drinking water, Cleveland also became known for its pollution. In the early 1800s, there were very few governmental controls to limit how businesses functioned within the environment. More businesses attracted more people, who built more cities and towns around them. Continued population grown in the area continued to spur not only the release of factory waste products into the river, but added to that were increased urban runoff, non-point pollution, and later combined sewer overflows. 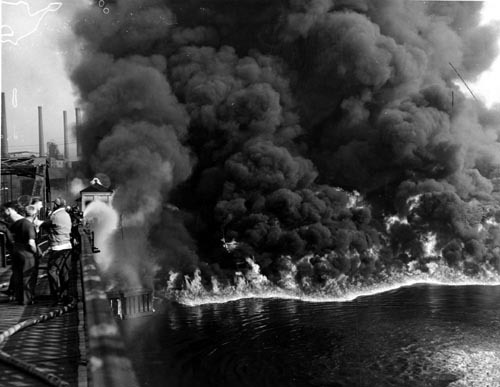 As a result of the pouring in of contaminants, the Cuyahoga soon developed a layer of film on its surface, and this is what would burn whenever ignited. On August 1, 1969, Time magazine reported: "Some River! Chocolate-brown, oily, bubbling with subsurface gases, it oozes rather than flows. 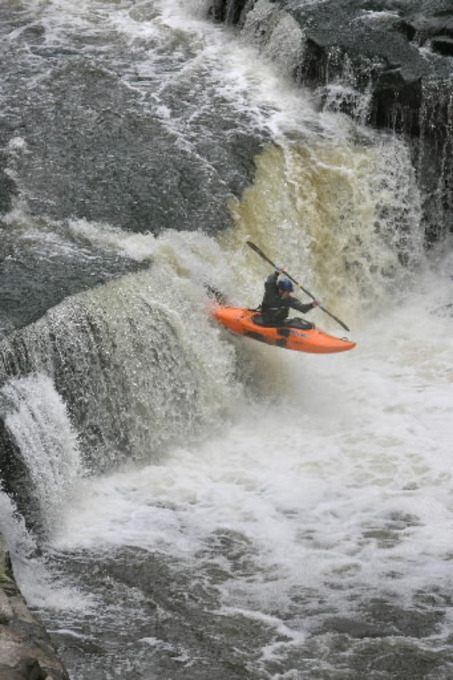 'Anyone who falls into the Cuyahoga does not drown' Cleveland's citizens joke grimly. 'He decays'. . . The Federal Water Pollution Control Administration dryly notes: 'The lower Cuyahoga has no visible signs of life, not even low forms such as leeches and sludge worms that usually thrive on wastes.' It is also -- literally -- a fire hazard." And, in fact, they were correct on more than one account. At this time, the entire length of the river that flowed between Akron and Cleveland was nearly completely devoid of fish and other aquatic life, and as was observed by a Kent State University symposium, the sledge on the surface of the water could be seen for miles and miles, with oil traveling in slicks sometimes several inches thick. 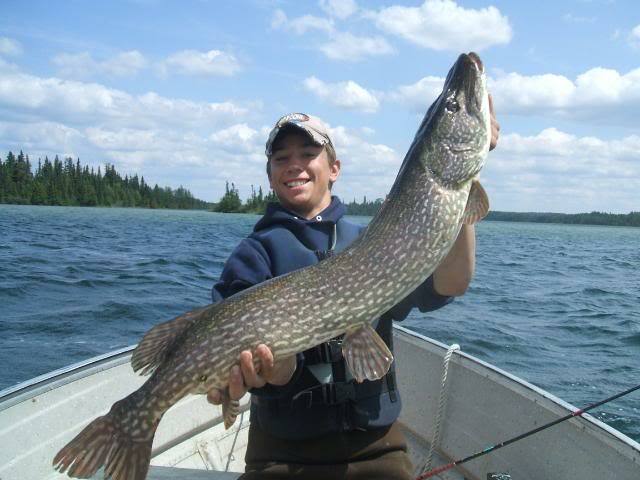 Since the 1970s, water quality has greatly improved. The mouth of the river used to be a swampy marshland, where water would slow down as it reached the lake. This would cause the drainage to back up and cause more pollution problems up river. As a result, the mouth of the Cuyahoga was moved about 4,000 feet from it's original marshy mouth and a man-made mouth was created. The Army Corps of Engineers maintains the depth of the river mouth by dredging, it to a depth of 27 feet. In addition, the banks have been straightened and turning basins widened, which help keep the water moving. Of course, the best improvement came in the form of the Clean Water Act and the Great Lakes Water Quality Agreement. While the river and the subsequent lake issues are still being addressed, life has returned to and the waters are once again safe to enjoy recreationally.